﻿Using real-time, high-resolution imaging, scientists have identified how a "doorway" in the blood vessel wall allows cancer cells to spread from breast tumors to other parts of the body. The findings lend support to emerging tests that better predict whether breast cancer will spread, which could spare women from invasive and unnecessary treatments, and could lead to new anti-cancer therapies. The study was published in the journal Cancer Discovery. 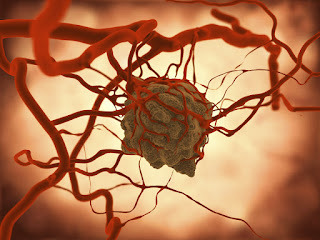 The researchers have previously found that breast cancer spreads when three specific cells are in direct contact: an endothelial cell (a type of cell that lines the blood vessels), a perivascular macrophage (a type of immune cell found near blood vessels), and a tumor cell that produces high levels of Mena, a protein that enhances a cancer cell's ability to invade. The site where these three cells come in direct and stable contact - called a tumor microenvironment of metastasis, or TMEM - is where tumor cells enter blood vessels. This new research indicates that the TMEM macrophage releases a protein called vascular endothelial growth factor, or VEGF, which causes a local increase in blood vessel permeability. The effect is temporary but can last long enough to allow cancer cells to enter the blood stream - escaping the primary tumor and traveling to distant metastatic sites. The researchers also observed for the first time that transient blood vessel permeability and tumor cell entry into the bloodstream occur simultaneously and exclusively at TMEM sites. The discovery was made using intravital high-resolution two-photon microscopy to image primary breast cancer tumors in mice and human xenografts (human breast cancer tissue grafted into mice). "The discovery of a unique doorway that allows tumor cells into the blood stream opens new opportunities for the development of anti-metastasis therapeutics," the researchers concluded. Based on material originally posted by Albert Einstein College of Medicine.